Data capture on one CAN or LIN channel. The intuitive ribbon concept facilitates easy access to the available functions. A Trace View neatly arranges the raw values of the CAN or LIN messages. An Activity View offers graphical programming capabilities for message injection. A Device Manager View provides the functionality to manage connected devices and configure the state of all supported buses. Expandability allows to connect K2L solutions with own hardware/ software or with 3rd party solutions. 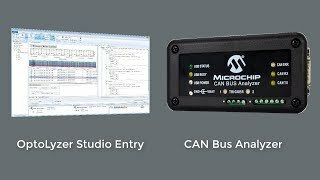 OptoLyzer® Studio Entry V1.5.1 comes with enhances features for CAN development with Microchip's CAN BUS Analyzer hardware interface: Filters, Activities, Replay, Tiles, dbc import. This video gives a short overview of OptoLyzer® Studio Entry V1.5.1.